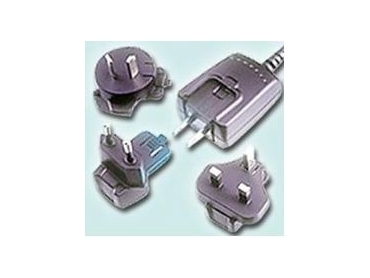 They come with a US plug as standard and a range of AU/EU/UK interchangeable plug clips. RELTRONICS has released miniature, switched-mode dc power supplies. They measure 60mm × 45mm × 30mm and are available in dc voltages from 3.3V to 12V and currents of up to 3A, equivalent to 3.3W-15.6W. The input voltage range is 100V-240V ac ±10% full range with a frequency range of 47Hz-63Hz. The adaptors offer short circuit protection with automatic recovery, hold-up times of 16ms, typical efficiency of 70% at full load and typical regulation of 5%. The power supplies have a power consumption of less than 1W at no load. The power supplies have a coupling capacitance of 1nF between primary and secondary sides. They come with a US plug as standard and a range of AU/EU/UK interchangeable plug clips. The output dc plug is 2.1mm as standard but the power supplies can be provided with any type of common dc plugs on request. The power supplies have EMI (EN55022 CISPR 22 Class B), EMC (EN55024, CE, C-tick) and Safety (EN60950, TUV, UL, GS, BS) approvals.